Thymus. Light micrograph of a section through the medulla (inner part) of an immature thymus from an child. The thymus is a gland located in the upper chest that plays a part in the development of the immune system. It begins to shrink after puberty. 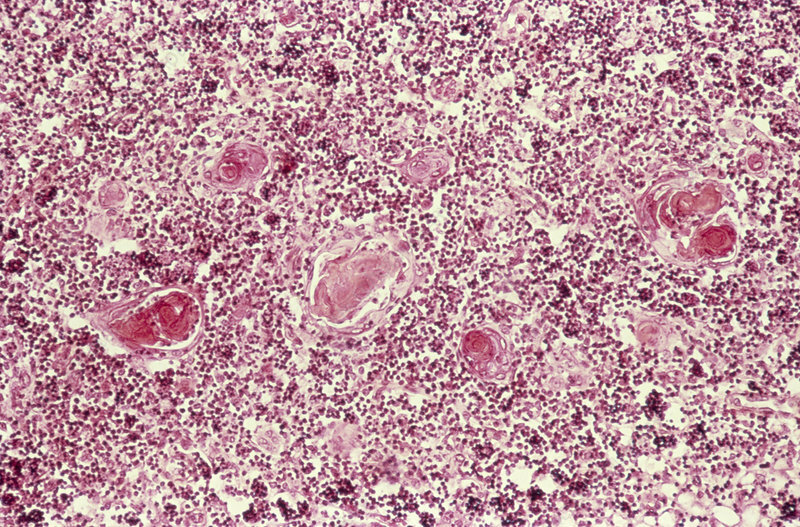 Visible here are several Hassal's corpuscles (dark pink), which have an unknown purpose. Before puberty, the thymus is responsible for the conditioning of lymphocytes into T (thymus) cells. The dark dots here are maturing white blood cells, which help the body fight invading organisms. Magnification unknown.